I am in love with the United Kingdom. After I graduated from college (which was a miracle considering I was a lot more social than studious...much like my father), my dad took me on a 10 day trip to London. And WOW! What a haven for the history/literary nerds! My dad and I had the best time. From Westminster to the Tower of London to Hyde Park, we explored as much as we could and ate fish and chips to our hearts' content in many of the pubs located in London and everywhere. The British love their pubs. One of the days (I think my dad and I both say it was our favorite day), we traveled to Oxford. The only thing either of us had planned for that day was to explore and find the pub that C. S. Lewis and Tolkien and the other Inklings visited regularly to talk about their writings. When we found The Eagle and Child, both of us could not contain our excitement. We sat down at a random table and ordered. And while we were waiting for our food, as we looked around, we noticed all the plaques surrounding the table we were sitting in, and to our complete and utter surprise, we were sitting in THEIR BOOTH. It was such a surreal experience for both of us and I'm so happy that I got to share that with my dad. So, really, it's no surprise that I would want to pick this book up and read it. This book was all the more magical because I had been to those places and could imagine Joy and Lewis (or "Jack", as his friends would call him), strolling along in Oxford. Before Joy met Lewis, she became a Christian (just like Lewis); not because she was searching for Him, but because God surprised her in her great need. After this, Joy wrote to Lewis, hoping for answers to her many questions about Christianity. And Lewis wrote back. Thus began her incredible journey of deep friendship with him that eventually turned into love. This is Patti Callahan's debut Christian novel. After reading this book, I seriously hope she keeps writing. She wrote so incredibly well that I could picture everything vividly in my mind. I've been a fan of C. S. Lewis my entire life, and the way she wrote his dialogue and described him--I totally get why Joy was so drawn to him. This book was also a story about Joy's entire life, leading up to her marriage to Lewis. She's mostly famous for the end of her life, so to read about what happened before that was so interesting. 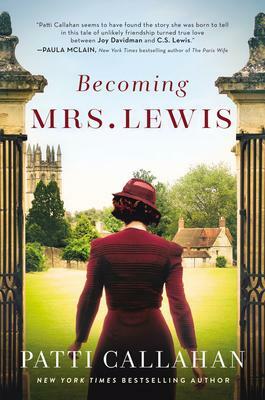 For more information on Becoming Mrs. Lewis by Patti Callahan, come and visit us in store or check out our website here. Rarely have I seen something so real, raw, and honest as this. When there is no rhyme or reason--God doesn't heal you, and those perfectly formulated formulas of life, love, and the divine don't add up, where does that leave you? When Kate Bowler was diagnosed with stage IV colon cancer, it tore at the seams of the prosperity-gospel theology she had surrounded herself with. Everything Happens for a Reason: And Other Lies I've Loved tells her story, "offering up irreverent, hard-won observations on dying and the ways it has taught her to live", and it's what I affectionately call a "bleeding heart". Every chapter, every page, every word is chock-full of so much full, sorrowful, beautiful emotion that I felt like crying every time I sat down with it, just as a way to release the feelings building and twisting inside of me as I read. "What would it mean for Christians to give up that little piece of the American Dream that says, "You are limitless"? Everything is not possible. The mighty Kingdom of God is not yet here. What if rich did not have to mean wealthy, and whole did not have to mean healed? What if being people of "the gospel" meant that we are simply people with good news? God is here. We are loved. It is enough." With God, you're limitless, except when something does stop you. Except when you reach your very real, very tangible limits, and things don't go your way anymore. Like Kate, since pondering this disillusionment with the concept of limitlessness, I've become more comfortable with the times when life is no longer under my control (as if it ever really is). Human mortality stares us in the face every day, but in the shoes of someone like Kate, it no longer seems to just stare. It screams. It shrieks. It rages. It becomes a thing so impossible to ignore that the only thing left is to ask the questions: the hard questions, the real questions, the painful questions, the terrifying questions. I've never heard ask them better than Kate does. Her cynicism reads like a breath of fresh air after a long day cooped up in a stuffy house; the hope and grace woven through her words feels like a full, warm embrace. This book is a balm for the suffering, wondering why they suffer. And it's so incredibly helpful for those seeking, searching, trying to understand the threat of cancer in their family members and friends. There are two helpful appendices at the end: "Absolutely Never Say This to People Experiencing Terrible Times (A Short List)" and "Give This A Go, See How It Works (A Short List)". They're meant to guide and help those of us who don't know what to do or say, and are in danger of harming our already hurting loved one with our good intentions. For more information on Everything Happens for a Reason by Kate Bowler, visit our website here.